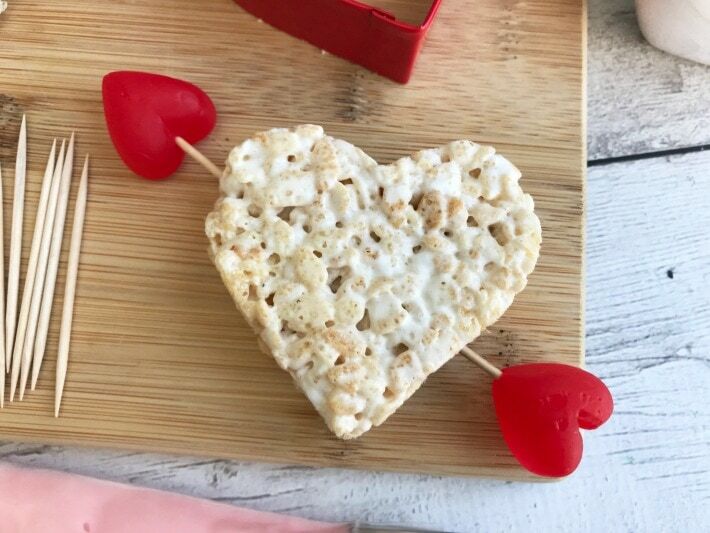 Make these cute and yummy Cupid’s Arrow Valentine’s Hearts Rice Krispie Treats for your school or office party. I could eat a whole pan of Krispie Treats by myself when they are still warm. So good and these were one of my favorite treats growing up. My kids love them just as much as I did. 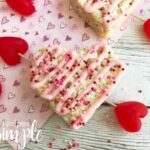 Rice Krispie treats are a quick and easy dessert to make. 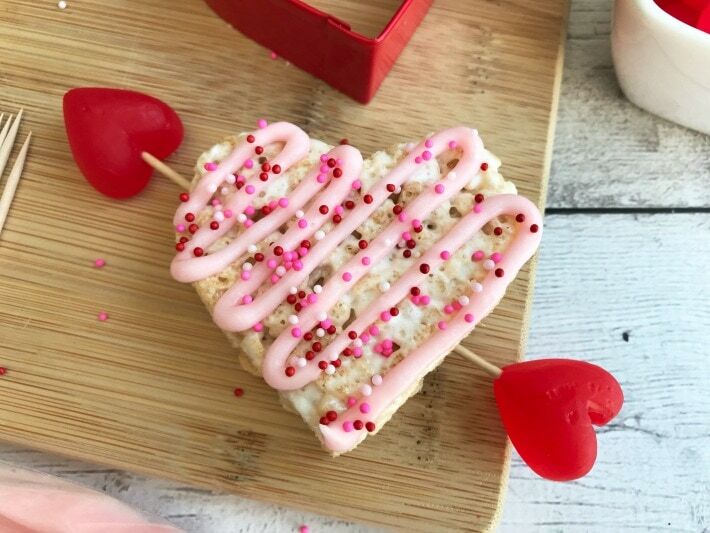 It’s fun getting creative with Rice Krispie Treats for Valentine’s Day. Get the kids to help you. They will have fun decorating them and eating them. 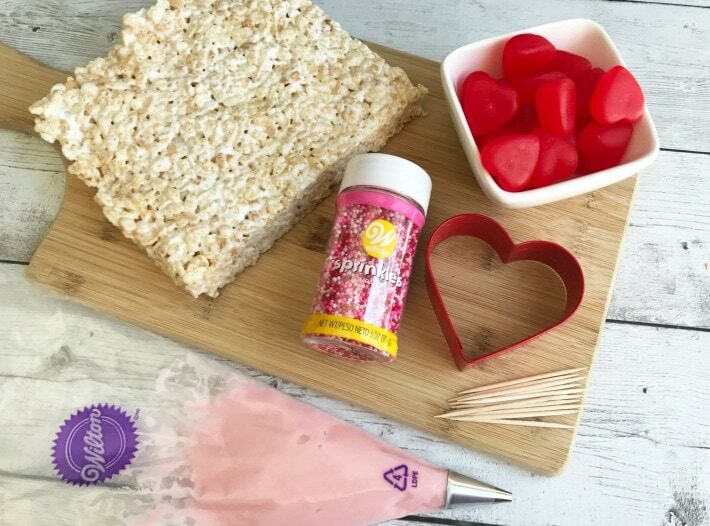 Once you make your Rice Kripsie treats (see printable recipe below) gather everything together you’ll need to start decorating. You’ll need a 2″-3″ heart cookie cutter, Small round frosting tip, Disposable piping bag, Valentine sprinkles, Toothpicks, Red gummy Heart candies (I used Brach’s) and kitchen scissors. Stick one gummy heart candy on one toothpick. Take a second heart and use the kitchen scissors to snip a triangle out of the top. Place this heart on the other toothpick. Attach the small round frosting tip to the disposable piping bag and fill with frosting (see frosting recipe below). 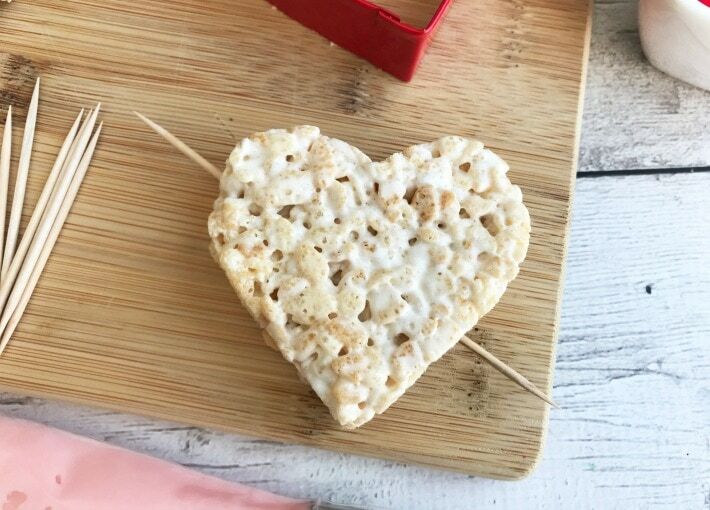 Gently squeeze the frosting out onto the heart Rice Krispie in a back and forth motion. Sprinkle with Valentine sprinkles. 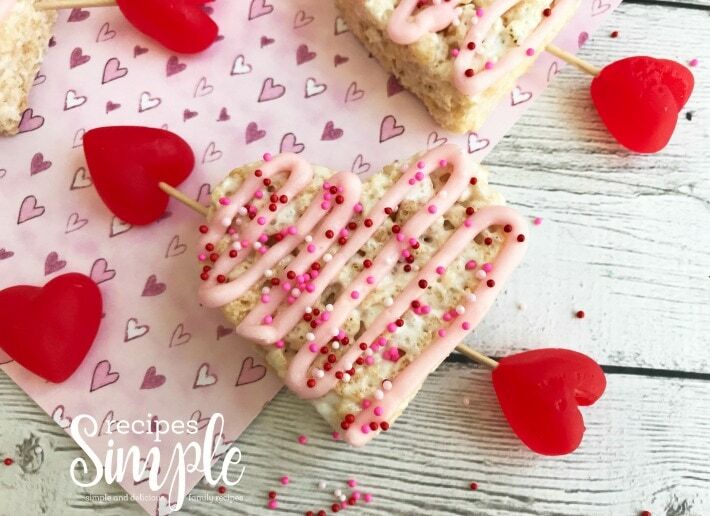 Have fun making these cute and yummy Valentine's Rice Krispie Treats. Take a second heart and use kitchen scissors to snip a triangle out of the top. Place this heart on the other toothpick.